The Henry Vilas Zoo is one of the best places to visit in Madison. There is no entrance fee to the zoo, which is wonderful. It is also the perfect size to take children, small enough that you can make it through in an hour, but with enough variety to hold their interest. There is a newly renovated Children's Zoo, which includes a goat feeding area where, for 75 cents you get a pellet filled ice cream cone to feed them. The Children's Zoo also is home to the Conservation Carousel, which for one dollar you can ride almost any animal you can imagine. There is also a large play area for the kiddos. The zoo recently acquired three new giraffes, which my three year old can not get enough of. She would go to the zoo every day, if she could!! 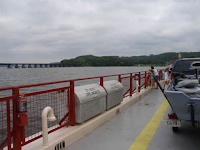 The Merrimac Ferry crosses the Wisconsin River about 10 minutes from Devil's Lake State Park. It is free. You can get some ice cream while you wait if there is a line. It's a novel way to cross the river instead of a boring old bridge.